Guzmania is a popular genus of bromeliad. Their colorful flower bracts can be found in shopping malls, conservatories and many other plantscapes as well as kitchen tables and office desks. While they are a popular in public indoor spaces they grow naturally from Florida to Brazil and are particularly common in Costa Rica and Columbia. Guzmania is named after the Spanish naturalist, Anastatsio Guzman. Guzman extensively traveled throughout South America and died while on an expedition in Ecuador in 1807. A short time after his death colleagues named this genus of bromeliad in his honor. Guzmania lingulata is one of the most popular species of Guzmania. Its common name is the scarlet star. The scarlet star has long, flat, glossy green leaves with smooth margins. The leaves come together to form a star shape in the middle. What is commonly mistaken as the flower on the plant is actually a grouping of modified leaves, called bracts. Guzmania lingulata is most famous for its brilliant pink or red flower bracts but can also be found in shades of yellow and orange depending on the variety. The true flowers are white and do not rise above the colorful bracts. The blooms can last 2-4 months. Guzmania lingulata is an ideal indoor or office plant. They survive well in low light conditions and tolerant of artificial light. They cannot, however, be exposed to intense direct sunlight. The plant can grow as tall as two feet and as wide as two feet. Most Guzmania are epiphytic meaning they use their roots to attach to a host plant such as a tree rather than grow in the ground. Epiphytes are not parasitic and do not cause any damage to their host. Guzmania can be either mounted on a substrate or planted in a pot. Because Guzmania roots act primarily as an anchor rather than a source for water and nutrients, if they are planted in a potting mix that remains too soggy they will easily succumb to root rot. There are several ways to avoid this problem. Use plant containers and potting medium that is porous, allowing adequate air circulation and fast drainage. You can purchase potting mix specifically designed for bromeliads or you can mix your own using ingredients such as peat moss, vermiculite, and bark. Root rot can be avoided with proper watering techniques. Be sure to let the potting mix dry before adding more water. Also note that Guzmania tend to be top heavy. You may need to anchor your container with heavy rock in the bottom to prevent your plant from toppling. Guzmania take in water through their central tank and leaves in addition to their roots. Keep water in the bromeliad’s tank, the space where the leaves meet and form a cup toward the base of the plant. Never put water in the bracts or flowering portion of the plant. It will shorten the life of the inflorescence. Make sure to flush the cup regularly to avoid disease and the build up of minerals found in the water. Preferably, you should use rainwater or distilled water to fill the tank. This will eliminate any salt build up on the leaves that tap water may leave behind. Because Guzmania are native to tropical areas, they prefer warmer temperatures and humidity. Guzmania should not be allowed to stand in temperatures lower than 60 degrees Fahrenheit and prefer temperatures between 70 and 80 degrees Fahrenheit. They will fail to thrive if the temperatures remain above 80 degrees for an extended period of time. Guzmania also like humidity. Be especially careful during the winter not to let your Guzmania become too cold and dry. This can be difficult when using central heating. If it is near a window make sure the temperature is as warm as the rest of the house and there are no drafts. To increase humidity, place the Guzmania near other plants or in parts of the house that are naturally more humid such as the bathroom or kitchen. If your house is very dry consider using a humidifier. Bipolaris sorokiniana or sac fungus can cause problems if conditions are not kept ideal for the Guzmania. Like most bromeliads, Guzmania will flower only once showcasing a long-lived bloom before it begins to die. A healthy plant will produce pups before it dies. Pups can be removed from the plant and transplanted to their own pot or they can be allowed to grow in clumps attached to the mother plant. For more information on propagation, download our free Guide to Bromeliad Pups. The Guzmania does not suffer from many pests especially when grown indoors. However, a Guzmania that is not kept at ideal temperatures and humidities can be more susceptible to root rot, mealybugs, and aphids. To avoid insect pests, keep new bromeliads separate from your plant collection for about three weeks. This will give you time to inspect your new plant for invaders. Plants grown outdoors in Florida may be susceptible to the Mexican Weevil. The Mexican Weevil is an exotic invasive species that has few natural predators in Florida and is very difficult to control. The larvae of the weevil eat important growing tissue and are very destructive to the plants. Guzmania zahnii has green, glossy leaves that droop downward. Some varieties have variegation down the middle and others have horizontal banding on the leaves. It has red bracts and yellow flowers that rise above the plant on a spike. Guzmania sanguinea has long, broad, flat leaves that cascade over one another and bend toward the ground. The bracts are bright red and become yellow or orange as they near the center of the plant. This plant is wider than it is tall. 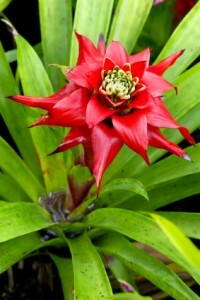 Guzmania monostachia is also know as the West Indian Tufted Air Plant. It is on the rare and endangered plant list in Florida. They are currently being threatened by the Mexican Weevil also known as the “Evil Weevil” to many bromeliad growers. The plant has broad, flat yellow-green leaves. The flower extends on a spike above the foliage. It is typically red on the end of the spike with white flowers. Guzmania can make excellent gifts. They will brighten anyone’s surroundings with their colorful bracts and they require very little care. Guzmania ligulata are particularly easy to find in grocery stores, nurseries and flower shops. Other species of Guzmania can also be a fun challenge to grow. They come in many shapes and sizes. 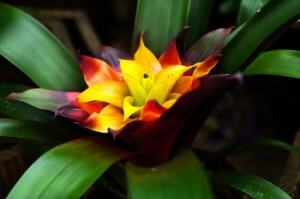 An avid bromeliad grower should enjoy having several varieties of Guzmania in their collection! my bloom has died its dry and still attached to the orignial plant, what do i do about the dead bloom? If it seems unsightly, you can remove it with a sharp sterile blade. Is the Guzmania Bromeliad ok to repot into Ericaceous compost. If not then what specific medium should I transplant it into please? . Any help Thanks. will the pups on the guzmania produce bracts,i have been nurturing them for about 1 year but no sign of the bracts yet. This is realy helpfull. Thank you so much. Learn how to care for your Hechtia bromeliad with this quick and easy informational guide. 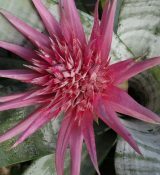 An informative site on the bromeliad (Bromeliaceae) family including classification, care requirements, propagation, blooming, diseases and insects, photographs, and product reviews.